A Cape Town Fish Hoek tagged image from photographer – mallix as published on Flickr. Right on the station. Fresh, cold draughts and *great* (well, maybe agreeable, when intoxicated) seafood any time of year. And you can take the train. Also a good spot to watch sport if you don’t mind the locals. And 30 mins away from my front door… Planning a big lunch here with a whole bunch of friends by rail soon. Altho breakfast is better elsewhere. Bar Guide: This complex houses a number of restaurants for any culinary taste, but I suggest the fish ‘n chips on the deck, nice and relaxed atmosphere full of students, tourists and locals. The sea can get quite rough so keep and eye on the waves, you will get wet! Directions: From Cape Town take the M3 all the way to the end. Exit and turn left down towards the Main Road. At the robots turn right into Main Road and follow through Lakeside, Muizenberg and St James to Kalk Bay. The Brass Bell is on the left hand side on the station, but to access this restaurant you pass through underneath the subway. 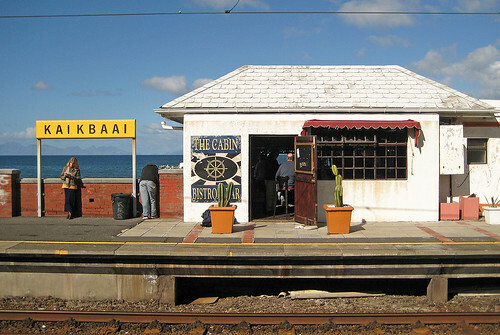 From Simon’s Town follow the Main Road through Glencairn and Fish Hoek into Kalk Bay. The Brass Bell is on the right. Or take the train..